It was one of those holiday crowds you expect to see during Thanksgiving weekend. Despite the fact that The Good Life was headlining at The Slowdown Saturday night — and I love The Good Life — our plan was to catch the openers and then drive across downtown to check out Milk Run and its new art gallery, which was having its grand opening. We got in at around 8:45 and got a table in the bar nearest the stage. High Up came on right at 9, the full ensemble kicked into one of their bluesier numbers that got the attention of the smallish crowd standing in the bowl. Frontwoman Christine Fink, a fireball of manic energy, told the crowd after the first song that everyone on stage was sick, then added that she just totaled her car. And with that, they went right into the next number. Maybe everyone was sick but you couldn’t tell from the performance. Christine directed that golden voice of hers with the usual bombastic energy, and sang with panache the band’s brand of golden blues, emoting in a way that the late Joe Cocker would admire — all jerky moves and pained expression, with a little James Brown shake thrown in to make it ultra-groovy. Fink is one of those rare performers who you can’t take your eyes off of, belting out each number as if she’s singing right to you… or at you. About half-way through the set it was clear she wasn’t feeling the best. 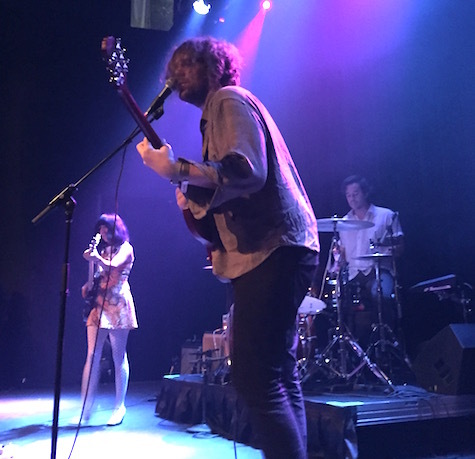 She pulled out a handkerchief from her back pocket and swabbed the sweat from her face, offering to dry off bassist Josh Soto’s own dew-covered melon. He passed, but she did it later in the set anyway. 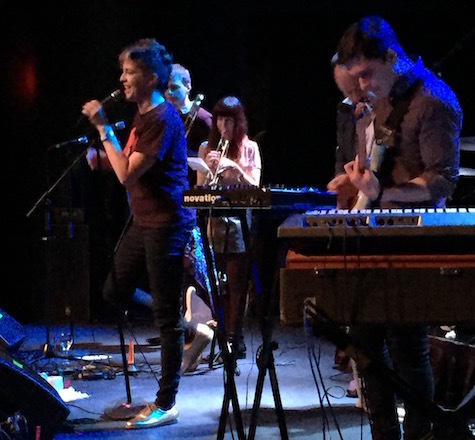 The band ended in a blaze of glory playing the single “Two Weeks” — a favorite of 2015 — and left the stage in a roar, winning over yet another crowd. High Up is closing out the year on a high note as the most talked-about band to emerge from the Omaha music scene in recent years. So who’s going to release their inevitable full-length? Saddle Creek could certainly use another show pony in its stable. If you haven’t heard by now, the once folky Big Harp has a brand new bag. The trio, which features the Chris Senseney, his wife Stefanie Drootin-Senseney and drummer extraordinaire Daniel Ocanto, went electric with their last album — the cassette-digital release Waveless (Majestic Litter, 2015) — and haven’t looked back. I overheard their new style described as psych rock, but it’s more of a garage rock / post-punk hybrid. Songs off Waveless would have fit in nicely on Frank Black’s earlier albums — a mix of solid melodies and heavy-rhythms but not afraid to take a proggy turn. Chris’ golden bray — the chief asset on Big Harp’s earlier albums — is just as comfortable on these brittle melodies, though it’s the frenetic, propulsive rhythm section that’s driving the band these days. These songs are jitter bombs of nervous energy. How long will the trio commit to this style of rock, or will they eventually fall back into the sleepy folk style where it all began? Here’s hoping they stay their current course (but not forget their past). 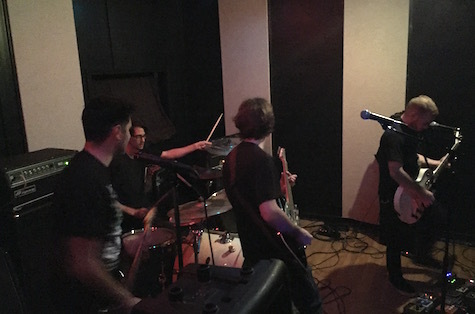 Timecat at Milk Run, Nov. 28, 2015. By the time we left Slowdown the club had filled nicely, but was far from a sell out. I’m told the number was around 350, which is a bit light for a Good Life show. Holidays, maybe? It was off to Milk Run next, but before we got there, a quick stop to pick up libations. Milk Run, located at 1907 Leavenworth (right next to Shuck’s seafood restaurant), is an all-ages venue that doesn’t sell booze but let’s you bring your own. We stopped at All Nations on 24th Street, an old-fashioned neighborhood liquor store, and picked up a couple quarts that had made a long trip from across the border — my Modelo Especial and Teresa’s Corona. We pulled into the parking lot behind the building and made our way into the fenced-in back area that connects the Milk Run venue with the 0709 Art Gallery — the name apparently a play on the addresses (Milk Run is 1907, the gallery is 1909). 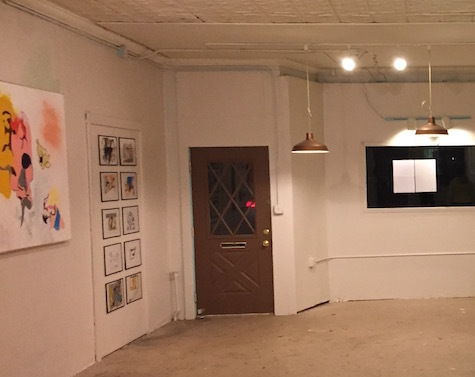 It is a huge space for an art gallery, and seemed even larger due to the limited number of pieces in the current show, “American Dizzy” by Collin Pietz of the band Fake Plants. Part of the plan for the gallery space is to have showings consisting of art created by members of bands playing next door at Milk Run, highlighting the full creative spectrum of these talented musicians/artists. A noble mission indeed. Next, we made our way through the revelers chilling outside and entered Milk Run. It’s amazing the difference a fresh coat of paint can make. The tiny venue was patterned in white and black vertical panels, sure to be a signature look in any photo taken at the club, just like those zig-zag stripes that hallmark any photo taken at the old Sweatshop Gallery. The original plan was to put the sound-mix equipment in a small room behind the stage that has a glass window, but apparently that didn’t work out since the small sound board was now located in the back near the entrance, taking even more space. What can I say, Milk Run was designed to be a small venue for small shows, and it’s downright tiny. No idea on what the actual capacity is, but I’d say no more than 60 would fit in there comfortably, especially when bands take up as much space as those playing Saturday night. There is no stage, merely a hard-wood floored performance space, where was stacked two huge Marshall amps — way more power than was needed to fill that room — along with two stacks of PA equipment. It was like putting a 350 Hemi in a ’67 Volkswagen Beetle. Good thing I had my ear plugs. Timecat, a local four-piece, was pretty amazing playing their style of heavy, aggressive indie rock (notice how I didn’t use the word “angular”?). Great stuff, but because of the over-powered amps, there was no way to hear the vocals through the much smaller PA — a shame. Chock it up to the new venue’s learning curve, one assumes they’re still feeling out the right combination of equipment, etc. Check out Milk Run’s Facebook page for a list of upcoming shows.